It is one month ago today since Dad died and this thought is on our minds as we lay in bed this morning. It does not seem that long ago. I get up at about 7:20 am but Kelly is a bit lazy today and does not get out till 8:10 am. Kelly and I walk to the spa and have another bath, saves using the shower! After breakfast, we take the others to the Engine Drivers' cottage to show them the galahs sliding down the roof. A couple put on a show before they all fly off. We leave at 9:25 am and drive the seven kilometres to the turn off to the Mound Springs. 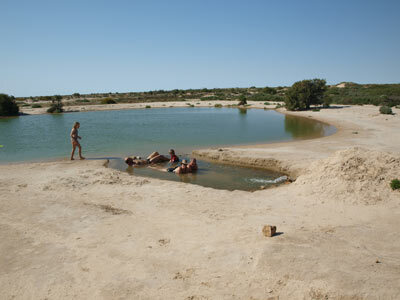 These are places where the artesian waters naturally come to the surface. Here they have formed sort of mini-volcanoes, with the deposited minerals building up a surrounding hill. 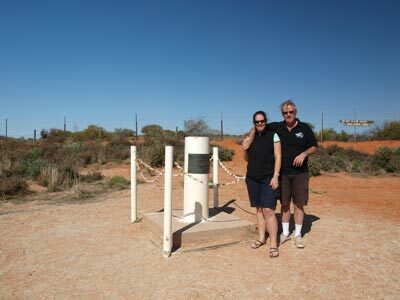 It is a very rough five kilometres off the Oodnadatta Track to the first one we visit (which is actually the second one you come to), The Bubbler. This is the more active of the two that you can easily see. 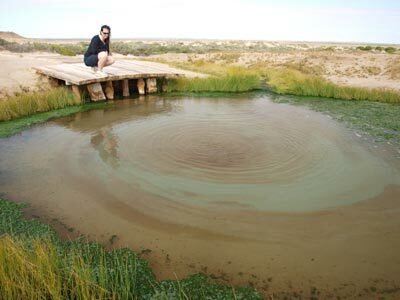 Here the warm water is bubbling up to the surface, taking turns to first come out close to the boardwalk and then switching to the other side. There are a lot of bubbles coming up as well and the very colourful sand/soil at the bottom continually moves, making very attractive patterns. There are also some animals living here, some tiny fish or tadpoles and some slater-like things. We then drive back to Blanche Cup. This is not as active, with a lot less water flowing into it. 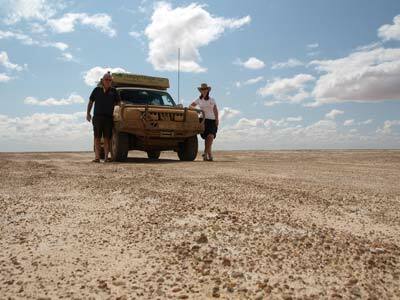 We leave at 10:15 am and suffer the corrugations as we go back to the Oodnadatta Track. 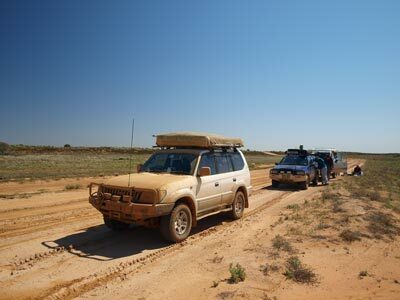 We continue towards Marree. 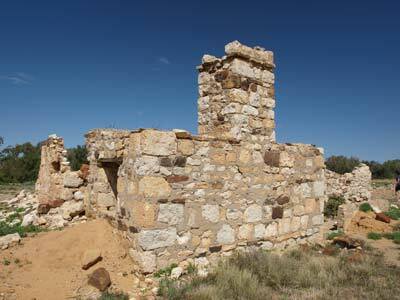 Four kilometres along we come to Margaret Siding, another Old Ghan railway fettlers' cottage. These all consist of three two roomed "apartments" under the one roof (well, if these was a roof left). The rooms are a kitchen/living area and one bedroom. Some also appear to have had another room at the back built from timber or fibro. We only stop for about seven minutes and are back on the road. There is a new section of road here which makes a loop to the right and back to the road again. On this we come to Margaret River, 13 kilometres from Margaret Siding. This creek is crossed by a concrete causeway and the water is flowing rapidly. I wonder where this water is coming from as there has been no real flow in any other creek. At 10:55 am we arrive at Curdimurka Siding. This is 42 kilometres south of Cowards Springs (52 km travelled). 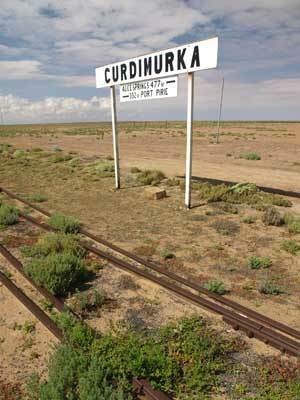 Curdimurka used to be the site of a biennial ball. This was held till the HIH insurance collapse and has not occurred since. Thousands of travellers used to turn up an attend the ball, all dressed in formal attire. A pity it is no longer held. The fettlers' cottage here is the most complete we have seen, with the roof still on and some of the rear additions in place. There is also a desalination plant and water tower, but these are about to fall over. There is also a kilometre or more of track in place. To the west of here the railway line crosses the river on the second longest bridge on the old line. 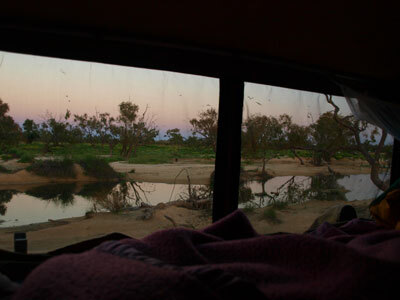 There are lots of swans, ducks and corellas on the river, it would have been nice to camp at the siding. We have morning tea here and leave at 11:50 am. 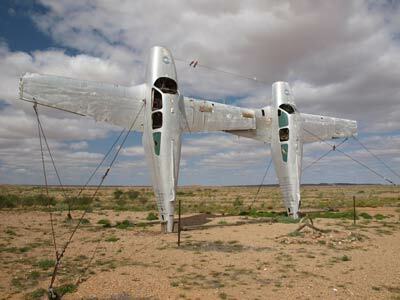 Only nine kilometres along is Lake Eyre South and we get there at 12:03 pm. There is a nice viewing area here as well as some excellent interpretation signs. 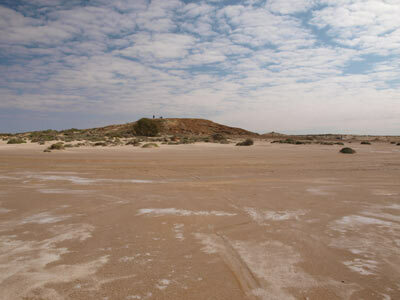 Lake Eyre is the lowest place in Australia, about 12 metres or so below sea level. Of course it is normally dry and the last time I was here in 2003 there was not a drop of water to be seen. Today is different and there is water about a kilometre or so from the road. The lake is about 80% full. Kelly decides to walk down to the lake. I follow her about 15 minutes later, taking the Prado. I drive onto the lake bed and end up at minus nine metres according to the GPS. I catch up with her and we walk towards the water, but stop about 200 metres away when we start sinking into the mud. 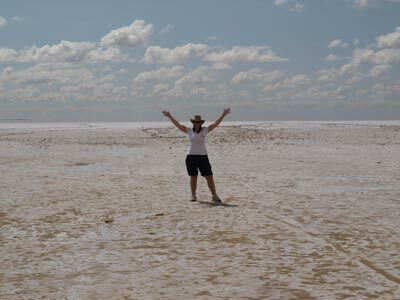 The dry sections are covered in salt, Lake Eyre when it starts to dry out is 10 times saltier than the ocean. We leave at 12:35 pm. 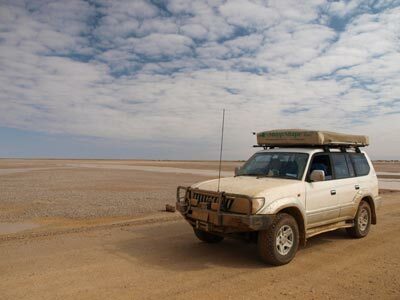 The road from here skirts the edge of Lake Eyre for a while before leaving the lake. 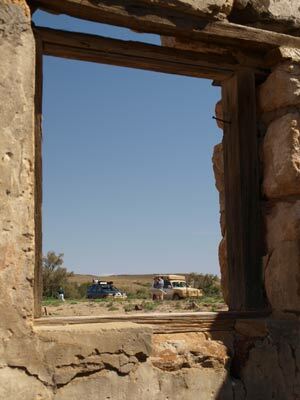 There is not as much to see, the Old Ghan line is still visible alongside the road, one moment on the left, the next on the right. The one thing you notice is that there are so many bridges on the railway line, seemingly hundreds, atlhough some are only a few metres long. We decide to stop for lunch at a place called Albeorrie Creek. This is near another siding, you can see the water tower. This is on private property. The strange thing about this tower is that it looks like a dog. Yes, a dog. I assume that the owner is a budding sculptor as a bit further on there are more strange sculptures. As well as the dog, there is a windmill turned into a large flower, two airplanes standing on their tails, a xylerphone made from large steel parts (car bits?) and a hovercraft bus on the rail line. We decide to have lunch here so we can enter the property (it is allowed) and look closer at some of them. 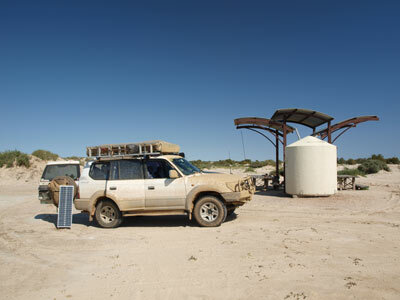 Peter T decides to head onto Marree so he can have a cooked lunch. We head off at 1:50 pm. It is a beautiful day, the best we have had for about 10 days I think, 21ºC. 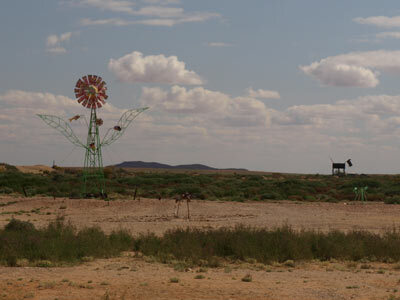 It is 52 kilometres to Marree and we arrive there at 2:50 pm. We need to refuel so go to the general store come service station. I put in 49.9 litres @ $1.77 a litre = $88.38. I go into pay and discover that the EFTPOS machine is out of order. In fact, not only is it out of order, all the land lines and mobile network is out of action. I tell the lady I cannot pay cash as I do not have enough. She reluctantly decides to record my details and run it up later. I have no idea why she does not offer this when I go to pay. Kelly has been trying to wash the windows but the water is now filthy. In additon, we need to put some water in the window washing reservoir. However, there is no water container to do this and there is no tap. We end up having to go around to the back of the store (after being sent the wrong direction the first time) to do this. While at the store I also need to find out if the road from Merty Merty to Cameron Corner is open. It was still closed when we were in William Creek. It is now open, we are getting luckier as we go on. 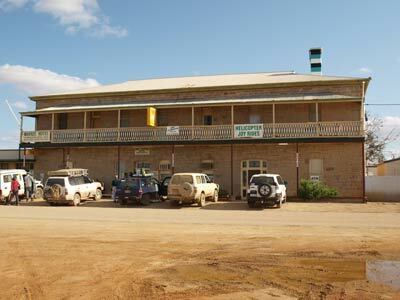 We drive over to the Marree Hotel and have a beer. Very refreshing. Here we find that the Innamincka Races that were supposed to be on today have been cancelled due to rain. After the beer we head off (3:25 pm) and head south towards Lyndhurst. As we pass the airport we see some decent size planes there. 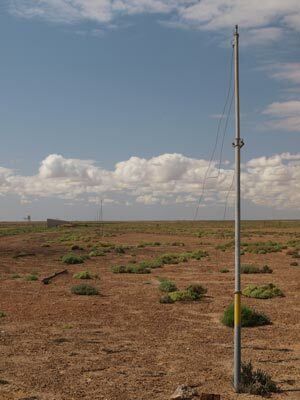 Lots of tourists are up here looking at Lake Eyre. The road south is tar for a little bit and then dirt. However, it is a good road. We stop to cut some timber for a fire and then continue on. 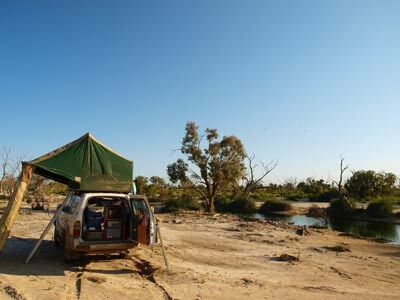 It is 55 kilometres to the Farina turn-off and about two kilometres into Farina and the camping area. 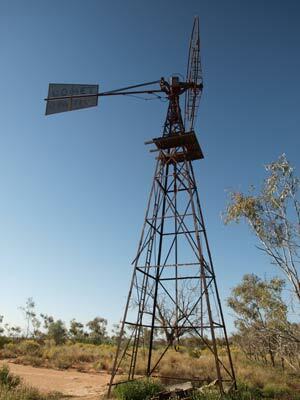 Farina was a town established in 1878 when it was the railhead for what became known as the Old Ghan Railway. The town was set out quite well, with intersecting streets, two hotels, school, Police station and more. 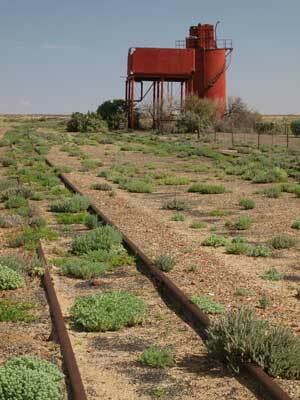 However, in 1884 the railway was extended to Marree and the town went into a decline from which it never recovered. Today there are the ruins of many buildings to explore, including the two hotels, the Police station, the old bakery and more. The bakery is especially interesting, as it is mostly underground and has been restored to working order. 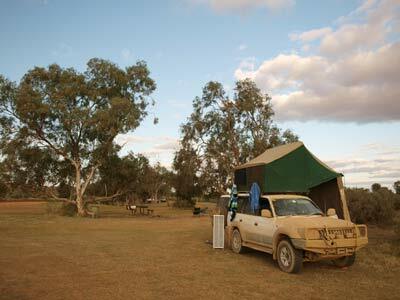 After looking around for a while, we drive to the camping area which is run by Farina Station. The Farina camping area is perhaps the best we have seen on this trip. Grassed and treed, it has a lot of space. There is only one other car here and we have the pick of the spots. It costs $5 per person to camp. There is a donkey boiler which heats the water for a hot shower using a small amount of firewood. The people already camped here have it up and running so we are certain to have a hot shower tonight. We set up camp and I start a fire as we are having another roast dinner. Kelly and I have showers, it is luxury to have a long warm shower as the water comes from a bore. After this I walk to a war memorial that has been built overlooking the camping area. The sun is setting and it is a nice view. The roast beef goes on, together with the usual pototo, carrots and pumpkin. A great meal as usual. There is a clear sky and we watch the stars through the trees. A great camp site! We go to bed at 9:30 pm and read till 10 pm. We are up at 7:30 am as we need to leave relatively early as we need to get to at least Monte Collina Bora or preferably, Strzelecki Crossing, both on the Strzelecki Track. 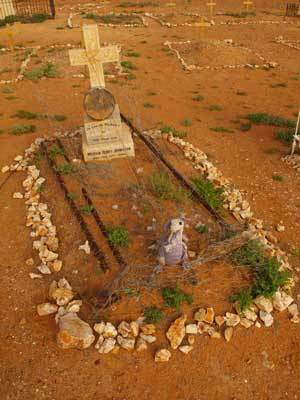 We leave the camping area at 8:30 am and head for the old Farina Cemetery. 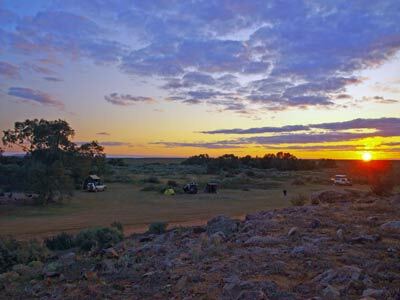 This is located about two kilometres to the north west of the camping area (proceed to the end of the camping area and follow signs). It only takes a few minutes to get there. The cemetery has been well restored, with many of the gravestones readable. I always think how terrible it is in all these old cemeteries that so many children died. No wonder people in the 1800s and early 1900s had so many children, in some cases less than half survived to be adults. There is also excellent interpretative material here about the cemetery and some of the people buried here. We return to the old town ruins where Peter T, Peter F and Tomas are having another look. We have a quick look around and then set off for Lyndhurst. It is 24 kilometres to Lyndhurst. 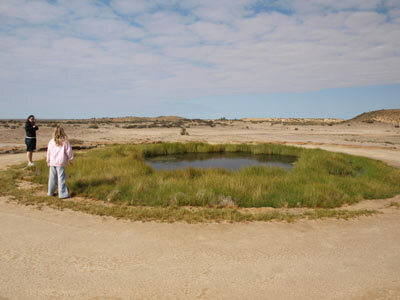 We pass by the ochre pits as we have already looked at one back in the West McDonnells. We arrive in Lyndhurst at 9:17 am. Peter T needs to feed his kids, so he orders a hot breakfast at the roadhouse while Peter F tops up with fuel as this section is one of the longest without fuel and if the road conditions are bad, he may need more than his tank contains. We leave at 9:40 am and head up the Strzelecki Track. 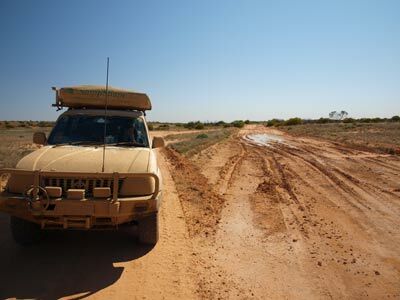 The Strzelecki Track used to be one of the roughest roads in the outback but after travelling it this time, Kelly called it the Strzelecki Highway. The scenery as we leave Lyndhurst is pretty good, with views south to the Gammon Ranges starting to come into view. After 50 kilometres we come to the first of a number of sections of tar road. This section runs for eight kilometres. At 10:42 am and 77 kilometres from Lyndhurst (almost 75 km/h), we come to a picnic area with views to the Gammon Ranges. We have morning tea here. We leave at 11 am. Just past here is the intersection for one of the access roads to Gammon Ranges. It is a beautiful day, about 18ºC and sunny. 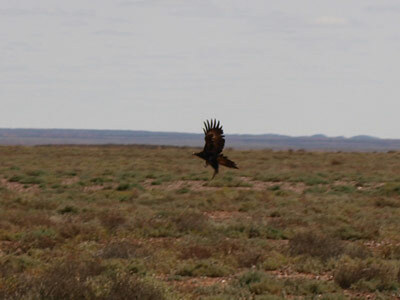 A further 27 kilometres along there is seven kilometres of tar and just past here we stop to look at a smallish wedge-tailed eagle that is eating a joey (baby kangaroo) which is on the road. The eagle was then attacked by two hawks as it flew off. 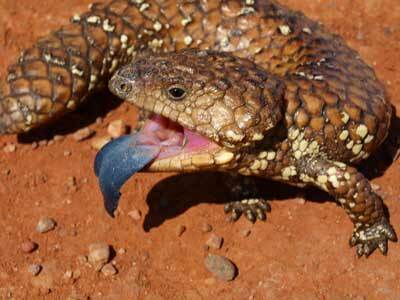 We also see a shingleback lizard on the road. We stop to take photos and it puts on a good display by opening its mouth at us. 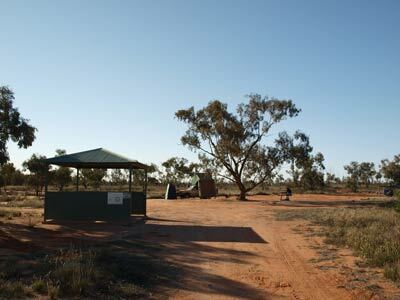 At the Murnpeowie turn off (the main access to Gammon and Flinders Ranges from the track) there is another picnic area. These have a covered table. There is another five kilometres of tar just before Blanchwater Station ruins. We arrive there at 12:20 pm, having covered the 158 kilometres from Lyndhurst in two hours and 40 minutes. Discounting stops, we are still averaging about 65 km/h or more. 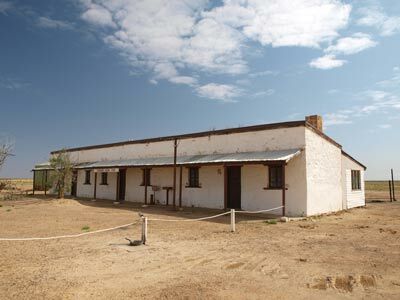 Blanchewater was the homestead for the Mount Hopeless Station back in 1861 when Burke, Wills and King attempted to get there from Cooper Creek on their ill-fated expedition. 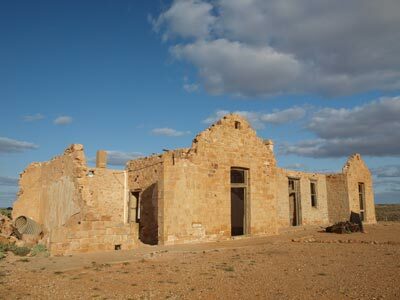 At that time, it was the northern-most settlement in South Australia. 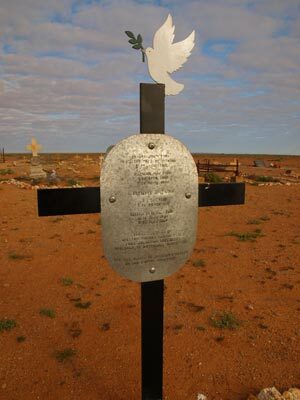 Of course, they failed and had to return to Cooper Creek where Burke and Wills died. The walls of the old homestead and some other buildings remain. We leave at 12:32 pm. 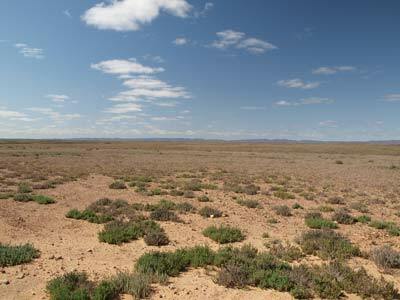 The terrain from here is a treeless plain, with no shrubs at all. The only trees are in the creek beds. 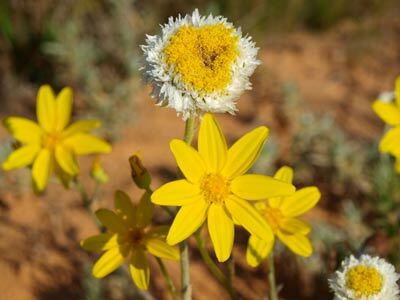 There are nice wildflowers, especially yellow and purple ones. Just over 20 kilometres from Blanchwater there is a sign saying there is another seven kilometres of tar. However, from memory there was actually only a kilometre or two. Looks like they ran out of money. Here we were passed by 10 4WDs heading towards Lyndhurst. I could not stand travelling in such a large group. At 1:30 pm we arrive at Monte Collina Bore. This is 225 kilometres from Lyndhurst. The bore is only a few hundred metres off the track. It is really not a nice looking place, sort of like a moonscape. In 2003 when we came here, it was blowing a gale and the dust was terrible. However, today there is no wind and the recent rains have made the ground a dried mud cake. There are picnic tables and sheds. You are permitted to camp here. The only attraction here is the bore. Very hot water, perhaps 50ºC comes out of a pipe into a small channel. It then flows into a earth tank (dam) and the out into a wetland. We decide to have lunch here and then have a swim. After we eat, all but Tomas go for a swim. The tank water is quite a nice temperature, perhaps 23ºC overall, with the top couple of inches about 30ºC. Kelly and I lie in the channel away from the pipe and it is about 43ºC or so. After a short time we have to move further away as it is too hot. Eventually I go back into the tank to cool down. This is a good spot to relax, but I do not know about camping here if the wind was to come up. Melanie and Keith have a good time in the water. We leave at 3 pm and drive further north. We stopped along here and cut some timber for our fire tonight. At 3:55 pm we arrive at Strzelecki Crossing. This is where the Strzelecki Track crosses the Strzelecki Creek. 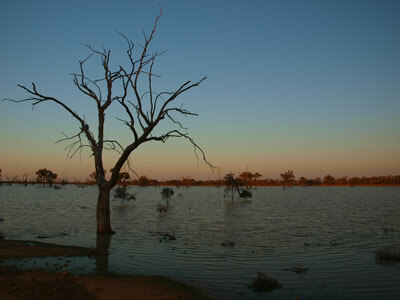 On 6 March 2010 the floodwaters from the January and February 2010 rains arrived at this location. Within three hours, the water had gone from nothing at all to a raging current, washing away the road and extending about 50 metres across. Within a few days the creek was 300 metres wide. We have a look around a few spots. 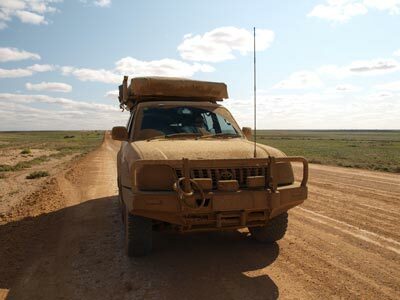 I am driving Peter T's troopie and head down one track while Kelly goes down another closer to the crossing. I find a reasonable spot but Kelly says she has a better one. I head back to the track and cross to the western side to have a look there. I have seen where she is as we cross and agree that it is the best spot. 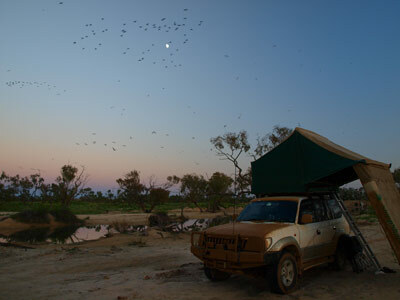 We decide to camp where Kelly has stopped about 100 metres off the track. This is on the southern side of the road on the eastern side of the creek. There is a flat area on top of the higher creek bank which has some grass but is mostly sand. Kelly and I decide to drive onto the sand on the lower bank. We set up camp and then have a look around. What a brilliant spot to camp! The birdlife is just amazing, far more birds than we have seen at any other place. The waters in the creek have stopped flowing and the pools are starting to dry up. There is still a lot of water, but the fishlife is suffering. 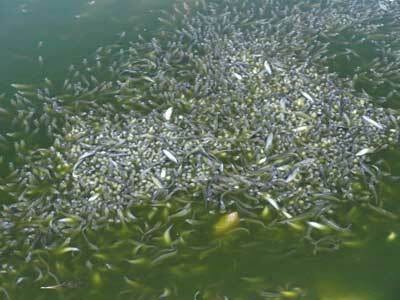 The small catfish are struggling, with the lack of flow and diminishing volume meaning the oxygen levels in the water are lowering. The fish float near the surface, still alive but struggling. As such, they are easy pickings for the birds. The gull-billed terns are swooping down and plucking a fish from the water with their beak as they skim over the surface. They have about a 75% success rate from what I can see. At the same time, the silver sea gulls are landing in the water and grabbing a fish. They have a 100% success rate. There are also lots of pelicans. These are not feeding at the moment, just flying over and landing on the edge of the creek. There are literally hundreds of hawks. They are in the trees, some trees have 20 hawks in them, and circling over the creek. There are brown falcons, black kites and black-breasted kites and other species. The hawks also try catching fish, but their success rate using their claws is probably only 10%. We walk to the crossing and see that it appears to have been only temporarily repaired. The remains of the old pipes and concrete are located about 100 metres or more downstream opposite our camp site. The two Peters and Kelly go crazy with their cameras, taking hundreds of photos. Peter T gets a couple of exceptional shots of terns plucking fish from the water. We end up back near the camp site sitting in our chairs and still watching the birds. Towards sunset, even more birds are seen. 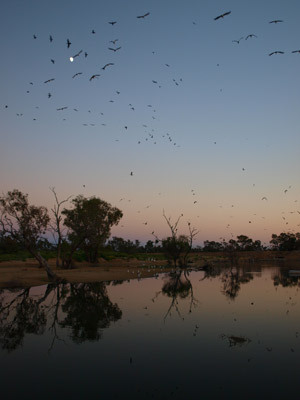 From both the north and south, huge flocks of birds fly pass. Tomas yells out "incoming" as he sights larger flocks. There are little pied cormorants, a hundred or more in each flock, dozens of pelicans, hundreds of Pacific herons. 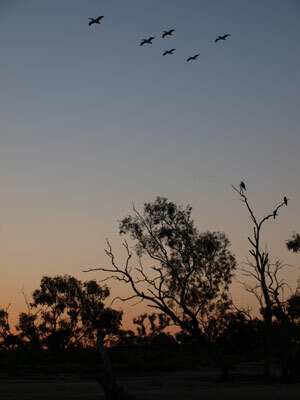 Around sunset some large flocks of budgerigars that come from the trees to the north of the crossing and whirl overhead. There are also a lot of crows. The sunset is also quite brilliant. By this time we have a beer in our hands and the fire going. A few cars pass and some road-workers come from the north back to their camp which we passed a few kilometres south of the crossing. A few semi-trailers, all with their second trailer pulled up on the back of the first, come south from the Moomba Gas and Oil Field. I have started the fire at 5 pm as we need some good coals to cook the lamb shoulder we are having. This is a Woolworths product and is marinated with rosemary. We have it with pasta and some canned vegies. After dinner, I cook an apple strudel in the camp oven. We go to bed at 9:30 pm and read for 30 minutes. There is still a lot of bird noise during the night, but not enough to be a trouble. I am up early at 6:10 am, the earliest of the trip, as the birdlife is going off, even more than last night. There are now even more catfish looking very sick, with perhaps millions of them in the waters near the Strzelecki Crossing. There are about 20 pelicans in the water just gorging themselves on fish. All the kites/hawks are back in the trees and the little pied cormorants and Pacific herons are flying overhead again. The gull-billed terns are feeding again as well. I take lots of photographs and Kelly soon joins me. The sunrise is also quite spectacular. Once back at the car we see that there are lots of dead or dying fish around the car. Looks like the birds dropped them during the night. We pick them up and throw them in the water. We have breakfast and then sit and watch the birds for a while. We do not have to go all that far today, so we decide to leave late and spend more time watching the birds. We pack up and then spend some more time looking at the birdlife. We finally leave at 9:25 am. It has warmed up a lot already and is now 17ºC. At 10:02 am we turn off the Strzelecki Track on the road that goes to Merty Merty. We cross the Strzelecki Creek at 10:10 am. We stop for a minute or two and take some photographs. The water here is just flowing. The road here also appears to have been washed away in the March 2010 flood. It is only nine kilometres across to Merty Merty and you see the station as we near the intersection. To the left is the old Strzelecki track. 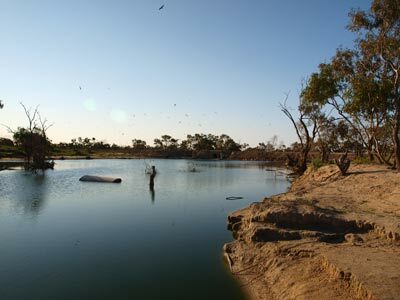 This basically follows the creek towards Innamincka. To right is Cameron Corner and NSW. We turn right. A kilometre or so along we pass where I camped in 2003. At 10:57 am we stop for morning tea between some sand dunes. The track here runs roughly south and occasionally crosses a dune to the east. It has taken 88 kilometres in 92 minutes at an average of 57 km/h. the road has a lot of water and mud across it but in most cases there are short detours around them. We leave at 11:20 am. Exactly 50 kilometres from Cameron Corner we come to the Yellow Bus. This is an old South Australian double decker. It is a wreck, with holes shot in it everywhere. We are still averaging about 55 km/h. By the way, have a look at the holes. You will know that in lots of TV shows and movies where Police hide behind their patrol car while they are being shot at by criminals. No-one every gets hit do they? Well, look at the holes in the bus. The smaller .22 rounds only appear to have just got through the aluminium outer shell, or in some cases, not got through at all. However, have a look at the larger holes. Not only do they go through the outer skin, they go through the inner skin (if there) and then out the other side of the bus. You can line up the shots. Hint, never hide behind a car if being shot at by someone with anything more than a small rifle. I hook up my tow rope to the bus and pretend to pull it along. Peter T takes a photo of this. The earliest graffiti we can find is 1982, so we know it has been here at least this long. How did it get here? We leave at 12:09 pm. It takes us 51 minutes to travel the 50 kilometres to Cameron Corner, an average obviously of 60 km/h. 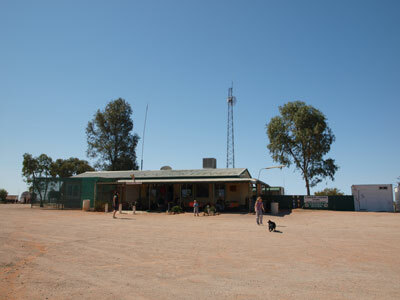 Cameron Corner is the intersection of New South Wales, Queensland and South Australia. At Cameron Corner we go to the shop which is just in Queensland. We order a beer each and Kelly has a steak sandwich and I have a pie and chips. There are quite a few cars here, all heading towards South Australia. They soon leave and we are the only ones there. The meal is quite good and reasonably priced considering where we are located. After lunch we drive over to the corner itself and have the obligatory photos taken. After this, Kelly and I go searching for golf balls. Golf balls? Yes, that is correct. Back in 1978, my late father, John, hit a couple of golf balls from South Australia over NSW into Queensland. I try to remember where I saw them land and walk over there. Within a minute I find a ball and a few minutes later Kelly finds another. We take photos of the balls and take one. However, when I get it checked by my brother back in Sydney, we find it cannot be the ball that Dad hit for a very simple reason. 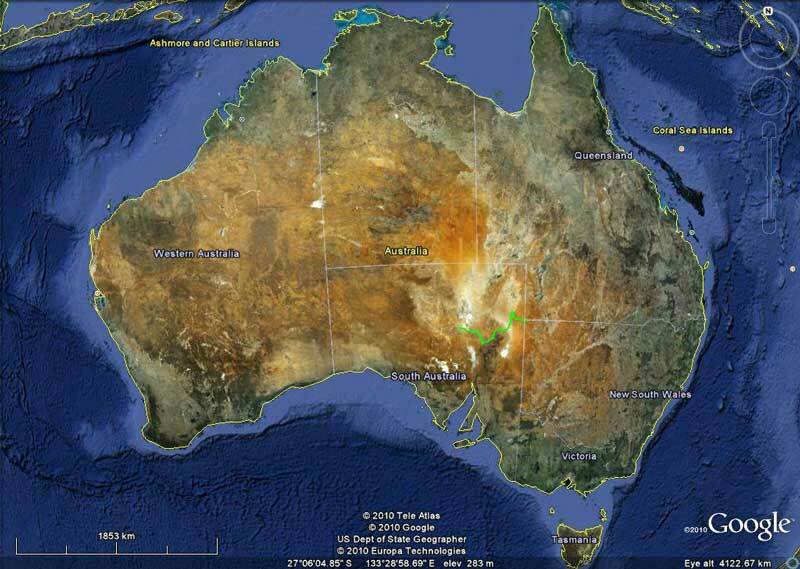 Until 1990, virtually all golf balls used in Australia were "small balls". Around this time the larger American ball became the standard. Back in 1978, there is no way that Dad could have purchased or obtained a "big ball". The fact is, this was a big ball, so must have been hit by someone after 1990. I have no idea if the other ball was large or small, I hate golf, unlike my brothers and Dad. Anyway, it gave us some good thoughts that they were the balls Dad hit as it was almost five weeks since he had died. 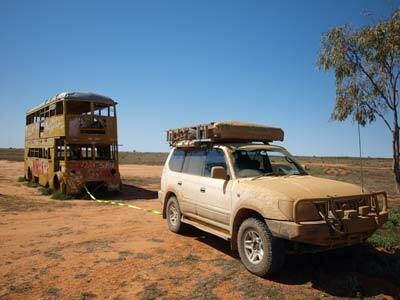 We leave at 2:07 pm and drive though the gate in the rabbit and dingo proof fence into NSW and Sturt National Park. One thing I am very cranky about is the fact that you cannot drive along the dingo fence. This is allegedly due to danger to the staff who maintain the fence. However, a few simple procedures would remove this danger (eg putting signs or warning cones across the track either side of where they are working). This should be a tourist highlight of NSW, driving along the dingo fence from one end to the other. No wonder NSW is in such a decline. 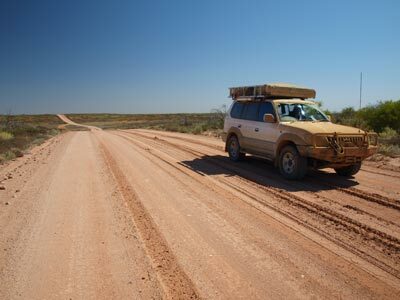 The road through the national park is not too bad, with a few corrugations in some parts. Just before the road meets the road through to Queensland, we see the sign proclaiming the T intersection. However, this sign has been modified by someone to read Toyota. I have an idea and Kelly (who is driving) turns around and heads back and parks alongside it. 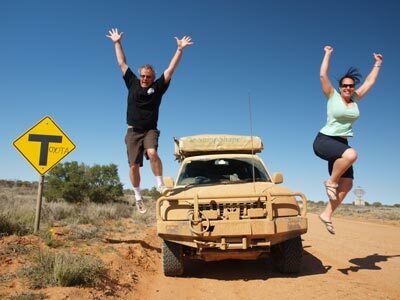 We stop Peter T as he comes past and get him to take a photo or two of us doing the Toyota leap next to the sign and a very dirty Toyota Land Cruiser Prado. Came out pretty good I think. Thanks to Peter for the idea of how to make the leap much higher (trade secret!). We turn right and at 2:50 pm we arrive at Fort Grey. 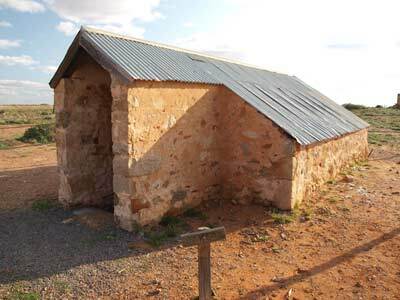 This is another of the old stations that was made into Sturt National Park. Near the homestead is the camping area. This is near Lake Pinaroo. Back in 1978 this lake still had a huge amount of water from the 1974 floods and in 1980 when I worked out here for a short while, it still had enough water to swim in it. The camping area is quite large, with a couple of shelter sheds housing gas barbecues and some tables and chairs. There is also a couple of toilets. We pick a spot towards the northern end and set up camp. Kelly and I decide to walk to the lake's edge. There is a walk to the very old homestead ruins. There are some walls remaining and a wrecked windmill. It is very interesting here to see the flood level of 1974, about three metres or more above the water level today. 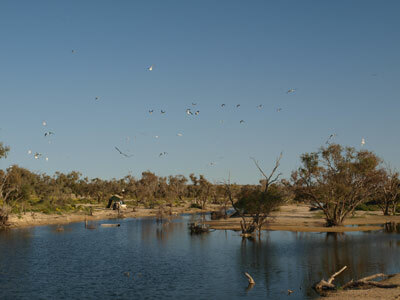 Normally Lake Pinaroo is empty, as it has been for most of the period since 1981. However, the rains in January and February 2010 as well as the follow up rain during the year has given it a good level of water. We walk back along the edge of the water. There are a lot of birds here, although not as many as most of the other places we have been to on this trip. We head back to the camping area. The normal walk here cannot be done as it is now mostly underwater, as is the tree blazed by Sturt after he left Depot Glen (see tomorrow's entry). We read for the rest of the afternoon and prepare dinner. Kelly is cooking her chilli peanut beef which we will have with rice. You are not permitted to have fires in Sturt National Park so we have to use the gas barbecues which also have a gas "stove top" burner. Just before sunset we walk to the water's edge again and take some photos of the sunset. We have a very nice meal and end up watching the stars for a while. During this, some talk of yowies, drop bears and bunyips scares Melanie and Keith so much Mellie cries and Keith climbs on my lap and clings close. Woops! Keith eventually falls asleep on me, the earliest he has been to bed on the trip I am sure. I have to carry him over to the troopie so Peter T can put him to bed. Kelly and I go to bed at 9 pm (NSW time I think).